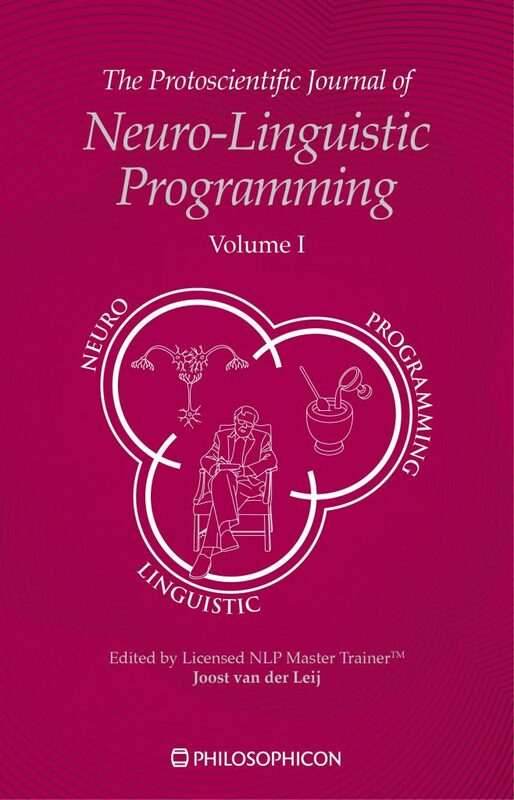 In order to introduce a culture of academically styled discussions and debate I start The Protoscientific Journal of NLP. With a title like this we make it absolutely clear that NLP is not scientific nor scientifically proven, but that the field of NLP is more likely to advance its understanding of NLP when there is a platform for well informed discussion. As I have written elsewhere NLP can benefit a lot from a more academic culture. The Protoscientific Journal of NLP is not meant as a way to advance the practice of NLP itself. Advancement in this regard is about making things simpler so they will be easier to do. This has been one of the fundamental aspects of the development of NLP from the get go and one of the many reasons why other attempts at an academically styled NLP in the past have failed. NLP is very easy to do, but hard to understand. Fortunately, you don’t need a lot of understanding in other to reap the benefits of the practice of NLP. Unless you are a NLP trainer of course. Then a thorough understanding is an absolute must and also painfully lacking in almost all NLP trainers worldwide. The Protoscientific Journal of NLP is aimed at NLP trainers in the hope that they will use this platform to increase their understanding or, if they disagree with what is written, enter into an academically styled discussion to make their point. The Protoscientific Journal of NLP will use the principles of NLP as its starting point. So no truth and no causation. The first volume will be philosophically and academically styled articles by me and I hope that in the next editions others will contribute with their writings, especially in the field of research. The first article has been written after having been inspired by the ABC-model from Behavior Analysis. Although NLP is not mentioned anywhere, it is written with NLP clearly in mind. For if there is a link of the ABC-model to the TOTE model then NLP practitioners can use the ABC-model without a hitch. The interesting part that surprised me is that the TOTE model actually played a role in the demise of behaviorism giving this reconciliation a nice level of tension. Even more surprising was the link to enactivism which, like NLP, has cybernetic roots and is often accused of behaviorism. Had I read Hutto’s Radicalizing Enactivism before writing Lesser Minds then the title would probably have been More Basic Minds rather than Lesser Minds. Lesser minds argues for a psychology without content. Again, although it nowhere mentions NLP, it is written with NLP in mind because to me NLP is a way of doing psychology without content. Or to put it otherwise: if people like Stich, Hutto and me are right about the lack of content in our brain or mind, then the current approach to psychology, including cognitivism, is a dead end road. It would mean that an approach to the human mind akin to what behavior analysts are doing in terms of the ABC-model would be much more likely to be fruitful. This is a very technical article which expounds the virtues of subjective Bayesian statistics. Again, it does not mention NLP, but one of the sections is about the results of our subjective Bayesian statistical research into our training and coaching activities which, of course, are all done with a lof of NLP involved. The article also shows that subjective Bayesian statistics is not only the best choice for NLP practitioners, philosophers and scientists in general, but also for behavior analysts in particular. When I read that almost no-one had ever tried to come up with a pure feeling theory of emotions I just had to see if I could come up with one. Once again NLP is nowhere mentioned but the article has been written with NLP in mind. To me the NLP approach to emotions is a pure feeling theory. This article has been written before Lesser Minds had been written. In the light of a psychology without content emotions have to be pure feelings or bodily movements. Everything else involves content and thus cannot be part of a psychology without content. In the article it is explained that there are good reasons and arguments why bodily movements would not count. So that leaves us only with a pure feeling theory. NLP does away with causation talk. The number one question people have about doing away with causation is what this means for morality and justice. Our justice systems seems to be all about determining who caused what. If there is no causation whatsoever, can we still have a justice system? This article shows that you can still blame people without needing causation. This is the first pure NLP article. On the one hand this article expounds my concerns with Dilts’ logical levels and on the other hand it demonstrates how academic reasoning can further a deeper understanding of NLP. As Dilts’ logical levels are very popular within the field of NLP, this is quite a controversial article. So it is okay to disagree with me. Yet, the hope of the first volume of the Protoscientific Journal of NLP is that those disagreeing with anything in these articles are also inspired to write up their own arguments for their points of view. Please send them to the Protoscientific Journal of NLP and then we publish them so that we get a more academic discussion within the field of NLP.